The Svalbard International Seed Vault, aka the Doomsday Vault, is to be built into the mountainside on the island of Spitzbergen, one of the Svalbard islands. The vault is intended to safeguard the world's agricultural diversity from catastrophe - global warming, nuclear war, asteroid strikes - the usual suspects. 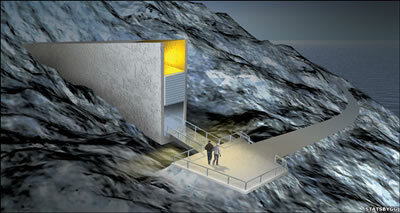 The facility will burrow deep into the sandstone mountain. Equipped with fashionable dual blast-proof doors, two airlocks and one-meter-thick walls of steel-reinforced concrete, it may provide an attractive haven to the rest of us when the time comes. The only unfriendly feature is the refrigeration, which is provided by standard units reinforced by the local permafrost, cooling the facility down to a less-than-toasty -20 to -30 degrees Celsius. Some seeds would be preserved for decades, others for thousands of years, depending on the seed type. Since the end of the Cold War, there has been a drop-off in the number of books and movies that forecast the end of the world. Alas, Babylon, a 1959 novel by Pat Frank set in south Florida, sticks in my mind as a particularly realistic fiction work. A Canticle for Liebowitz, Do Androids Dream of Electric Sheep and The Postman all deal with a post-Apocalyptic future. There were lots of great films too, like On the Beach, Dr. Strangelove, Planet of the Apes, The Omega Man, Soylent Green (Charlton Heston was a great Last Man) and many others. Update 18-Aug-2012: Take a look at the life bank from John Varley's 1977 novel The Ophiuchi Hotline and the genetic ark from Earth, a 1990 novel by David Brin. End update. Find out more at Crop Trust and at Norway to house seeds via Interactive/Media/Design.